Ser.Tec. Expands its range of digital printers with the ILed 2, a small but high-performance printer that is tailor-made to personalizing promotional items and printing on objects. The printing area of 295x575mm can be used to print on objects up to 170mm thick, making ILed 2 extremely versatile. 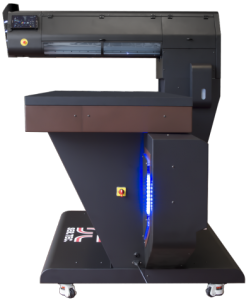 Iled 2 comes with a 8-channel latest generation print head, configurable with CMYK, white and gloss to meet the different printing needs and effects you want to achieve. Thanks to UV Led technology is possible to print on a variety of materials without pre-treatment, while the water cooled UV Led lam cure the inks during the printing making the material ready for use without further processing with considerable time and labor saving.